I grew up going to Holden Beach on the southern North Carolina coast. My grandpa had a house there for a long time; that’s where my dad always went as a kid. We vacationed at Holden until 2002, when my grandpa sold his house. Since then, we’ve been back to Holden once, and we’ve stayed at Hilton Head, North Myrtle Beach and St. Simon’s Island. My family loves our Southern beaches. 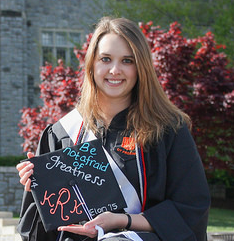 My boyfriend Kevin, who I met at Virginia Tech, grew up in northwest New Jersey. His family’s favorite beach spot is Cape May, on the southern-most tip of the state. When he invited me to spend a weekend with him at Cape May, my mind raced with rumors and stories I heard about New Jersey beaches from kids at my high school. 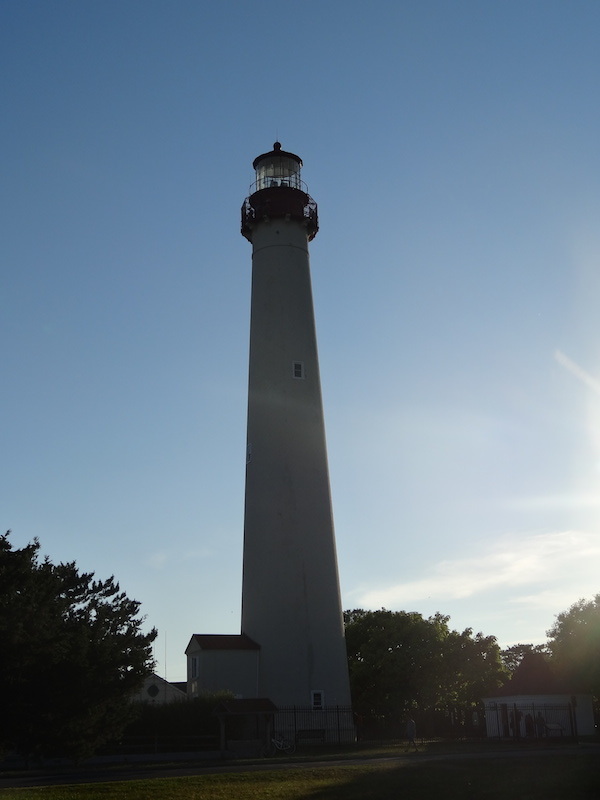 In my eight years (ugh) living above the Mason-Dixon Line, I had never ventured to any of the popular shore spots (they call it “the shore” up here), like Cape May, Wildwood, Ocean City or Stone Harbor. Delaware and Maryland beaches didn’t catch my attention, either. I told Kevin I’d never been to a beach farther north than North Carolina. 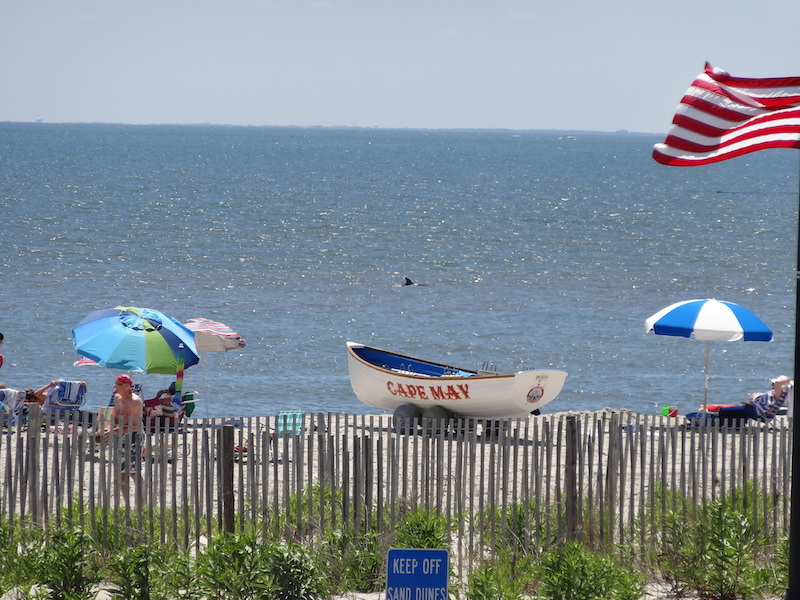 Cape May beaches…with a dolphin fin in the background! 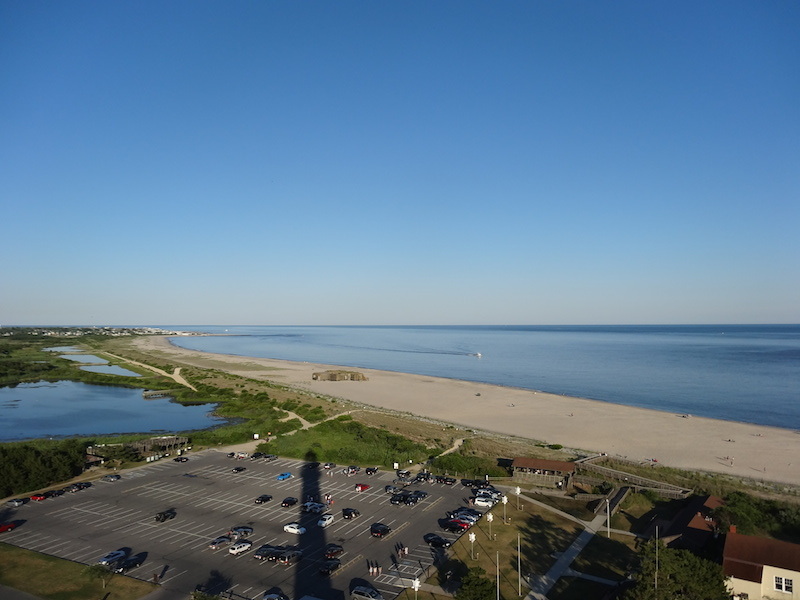 Cape May is a quaint, cute town; all the shops and restaurants, save for a couple by the marina, are within easy walking distance from all the hotels and condo units. The architecture is very old-fashioned Victorian, and most of the buildings—houses, hotels, shops, bed-and-breakfast inns—are painted in bright pastels. The town promenade is home to gift and surf shops, fudge and taffy kitchens, ice cream shops and several restaurants. Congress Hall has some cute shops, restaurants and cafes. There’s also a bundle of shops and an arcade on the boardwalk. The landscape differences struck me immediately. 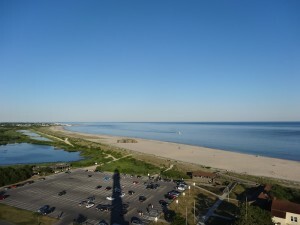 The main road, Beach Avenue, runs parallel to the beach and separates the town side, where the hotel was, from the boardwalk and beach. From our room’s balcony, I could look over the boardwalk and see brightly colored umbrellas stuck in the sand and the white caps of waves as they broke on shore. I don’t think I saw any directly waterfront houses, like our house at Holden. It was strange not seeing a line of houses with back porches that extend down to the sand. The town as seen from the top of the lighthouse. The boardwalk was a completely foreign concept to me. The only “boardwalk” I’d ever seen before was Barefoot Landing at North Myrtle. I had never seen that many shops and restaurants that close to the beach. At Holden, all the shops and restaurants were back across the bridge away from the beach and channel. But I did love the convenience of walking everywhere. The biggest difference, though, was the water temperature. At my Carolina and Georgia beaches, the water stays at a comfortable 78-82 degrees. Sometimes it feels more like bath water. New Jersey shore waters like to hang around the mid-to-high 60s. I learned this the hard way when I let a wave break on me one afternoon. It was so surprisingly cold that I yelped a little—okay more than a little—when I felt it. Kevin, of course, found this hilarious. “Aww, you must be new here,” he said through a chuckle. That Saturday night, Kevin and I had dinner at a seafood grille called The Rusty Nail. Confession: I’m not a huge fan of seafood, but I’ll sometimes eat it for the experience. I tried something new, something I didn’t even know you could eat: conch. We had “conch fritters” as an appetizer, and I was surprised at how much I liked them. They were like hushpuppies with pieces of conch meat in the cornmeal. They were especially tasty when dipped in the jalapeño-grape jelly. After dinner Kevin took me to see the Cape May Lighthouse and showed me the landing where the Cape May-Lewes Ferry docks. I will always say “yes” to watching the sun set behind a lighthouse. We left the next morning after having breakfast at The Mad Batter. But I couldn’t hit the Garden State Parkway without purchasing some rich, creamy fudge from The Fudge Kitchen. Until next time, Cape May! Sounds like a great time! Love the post! Love this post! I grew up in the south and have been livin in Philadelphia (super ugh) for 3 years now. 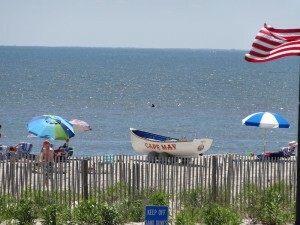 My husband grew up in North Wildwood and after these years it’s still all very foreign to me! If you ever go to WW and want to experience some real Italian deli food go into DeAngelis Italian market. That’s my in-laws place … I’ll admit I don’t eat meat so I’ve never eaten there (HAH!) but it’ll be an experience if nothin else. God bless !